What does a Burundian e-waste recycling entrepreneur, a large consulting firm and an IT leasing company have in common? Not much unless you bring together the core businesses of all three through a socially responsible collaboration with international not-for-profit WorldLoop. Smartphones are becoming the new PC, and it’s almost impossible to work in today’s business climate without one. For this reason, Deloitte Belgium, a strategic partner of WorldLoop, upgraded their employee’s smartphones to iPhones at the end of 2014 to facilitate stronger collaboration and access information. As a company, they found leasing a sustainable solution to ownership and contracted with CHG-MERIDIAN to roll-out new phones internally. CHG-MERIDIAN is also a WorldLoop strategic partner who has made it possible for its clients to offset future e-waste by participating in WorldLoop’s e-Resource Certificate Programme. As a leading service firm, beyond compliance leadership and taking up environmental and social responsibility globally is very important to Deloitte. Because of this, the company decided that for every new iPhone issued to a Deloitte employee, a contribution would be made to WorldLoop, supporting the collection and environmentally sound treatment of mobile phones in Burundi. 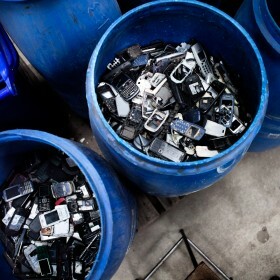 In other words, Deloitte’s internal roll-out helps ensure that more than 20,000 smartphones are spared from a landfill in Africa and are recycled in the best possible conditions by local social entrepreneurs and international treatment facilities.